Pineapples have exceptional juiciness and a vibrant tropical flavor that balances the tastes of sweet and tart. They are second only to bananas as America’s favorite tropical fruit. Pineapples are a composite of many flowers whose individual fruitlets fuse together around a central core. Each fruitlet can be identified by an “eye,” the rough spiny marking on the pineapple’s surface. 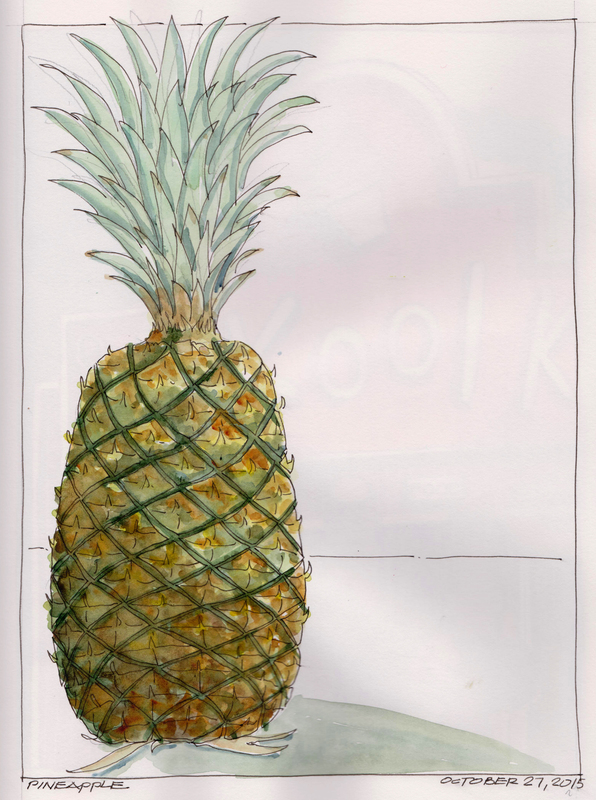 Pineapples have a wide cylindrical shape, a scaly green, brown or yellow skin and a regal crown of spiny, blue-green leaves and fibrous yellow flesh. The area closer to the base of the fruit has more sugar content and therefore a sweeter taste and more tender texture. Lamy Safari fountain pen with Noodler’s Black Ink and Holbein watercolors in a Stillman and Birn sketchbook. nice watercolour, but it does look a little flat perhaps the shadows could have been darker.